For other running routes, see the Route List. And if you're interested in an essay on what makes Berlin so special, take a look at this Ode to Berlin, written in the transition days after the Wall came down. NOTE: I ran this route on one of the hottest days of the year. My face was burning from sweat. The things I do to get good new running routes! Prenzlauer Berg is definitely Berlin's hippest neighborhood. Rents are going up and it's gentrifying, but it's still the home of a lot of weirdly creative folks, with their weirdly creative cafés, bars and shops. If you haven't been there yet, here's your chance to get to know this interesting piece of real estate, found in the northeast of the city center. 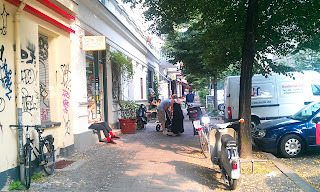 Prenzlauer Berg was built in the late 1800s on land previously used by windmills and grain fields for a rapidly expanding Berlin, with streets named after Prussian towns and statesmen. It was left relatively intact during the many bombing raids of World War II, and slept for 40 years as a working-class neighborhood in socialist East Berlin. The buildings were fairly run-down and unpainted by the time the DDR ground to a halt. And after German reunification in 1989, its decaying charm and low rents began attracting lots of artsy young people with a love for unpolished social diamonds. The heart of the neighborhood is the busy corner of Schönhauser Allee and Eberswalder Straße, with the Eberswalder Straße U-Bahn (the U2 line) station. The main nightlife is centered around this corner. The U-Bahn runs above-ground here, giving Schönhauser Allee a unique character. This route loops through the main sights of Prenzlauer Berg, including some of the main squares, along Mauer Park (remains of the Berlin Wall) and the very cool Kulturbrauerei (the converted Schultheiss brewery, now full of cinemas, clubs, artists' studios and music venues). Standing at the bottom of the Eberswalder Straße U-Bahn station, turn to the east and cross Schönhauser Allee. Then turn left and run northwards along that street, next to the elevated U-Bahn tracks. 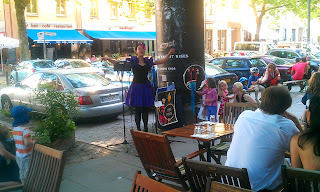 You'll see various strange boutiques and eating places, but the street is pretty loud. So, at the next corner, Gneiststraße, turn right. Everything already gets quieter and nicer, with trees lining the street. The stores get more interesting after the next block, when the name changes to Raumer Straße and you come to Helmholtzplatz. The streets are full of laid-back people hanging out at cafés, the square is one giant playground full of parents and kids, with mothers bicycling with home-made double-kid-carriers down the street. It's all so great that you'll soon want to shout "Please accept me as your new neighbor and let me move in here, and I'll never move away for the rest of my life, I promise! ", or something like that, anyway. At the end of the square, turn right on Dunckerstraße, which ends in a block at Danziger Straße. You have to cross this street at the one cross-walk, because a tram-line runs up the middle of the street. Then continue southwards on Husemannstraße. 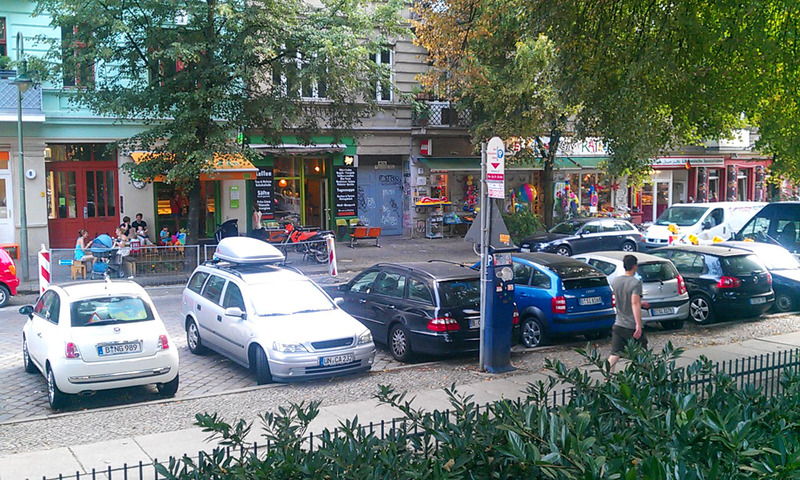 This quiet residential street quickly brings you to Kollwitzplatz, with some more cool shops and restaurants surrounding the little triangular square. Now run southwest on Kollwitzstraße, running past an adventure playground on the way. This street then merges into busy Schönhauser Allee again, where you cross the street and continue a block until Fehrbelliner Straße, where you turn right. This part of the neighborhood is almost strictly residential, with few shops or bars for many blocks. At the end of the first block, you'll come to the next square, Teutoburger Platz, where you cross it diagonally to the right, to continue northwest on Zionskirche Straße. 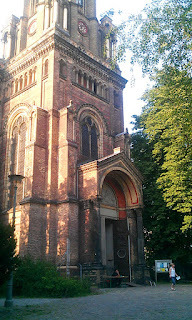 You will run right towards the big yellow-brick church (Zionskirche) down the street. Its pastor, Dietrich Bonhoeffer, was executed in a concentration camp in 1945. The local residents are trying to gather money to restore the church, which is in need of fixing up. Run past the church and continue directly out the back end of the churchyard on Schweinemünder Straße, going through still another square, Arkonaplatz, until you get to Bernauer Straße. This area belonged to West Berlin 25 years ago. The Berlin Wall went right through the neighborhood, so let's take a look. 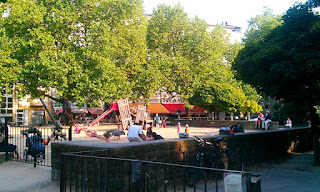 Turn right on Bernauer Straße and run past the old train yards until you come to some long steps on the left side, with a park stretching off behind them to the north. 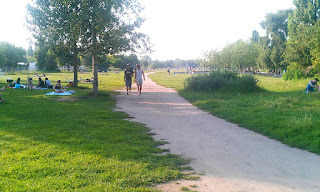 This is Mauerpark (Berlin Wall Park). 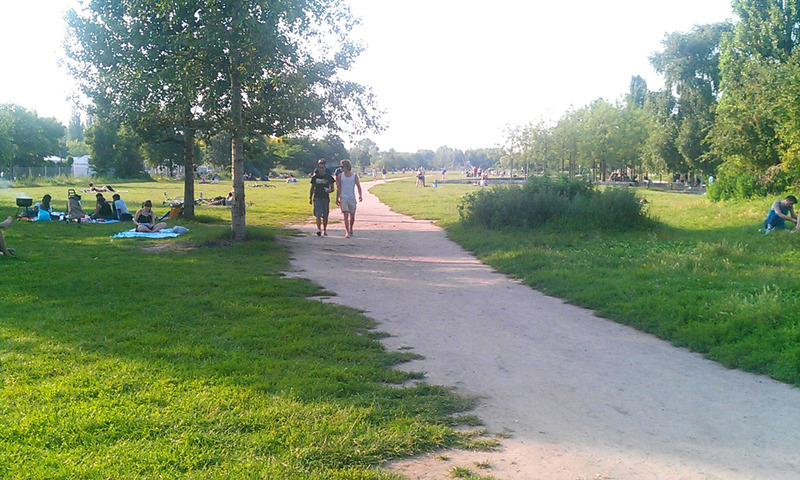 All that lawn that you see was once the death strip between two walls just inside East Berlin. I remember running on the other side of the wall, in the west, in the 1980s, never expecting to see the city reunited in my lifetime. Turn left to run up the dirt path in the middle of the lawn. You'll notice a stadium on a small hill to the right side. There is still a stretch of Berlin Wall remaining up there. So, after you pass the basketball court, turn right and take the path up to the wall on the hill. People still spray it constantly with graffiti, with some of it flaking off in big slabs. 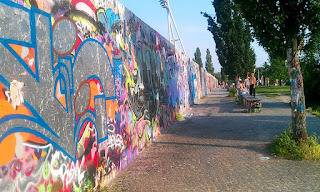 Run back south along the Berlin Wall until you get back to Bernauer Straße. Cross the street and then take the street that angles diagonally off to the left, Oderberger Straße. This street immediately has a lot of restaurants and clubs again. But they are no longer the off-beat hippie places found on the other streets, they are more conventional pizza- and Asian food places: as I said, the place is gentrifying. 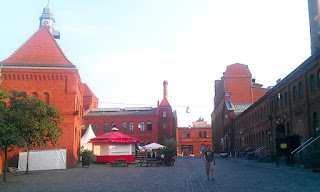 NOTE: When you cross Kastanienallee, if you turned left there, you'd come to the PraterGarten, Berlin's oldest beer-garden (almost 200 years old), and a great place to go on a warm evening, which I did after this run. 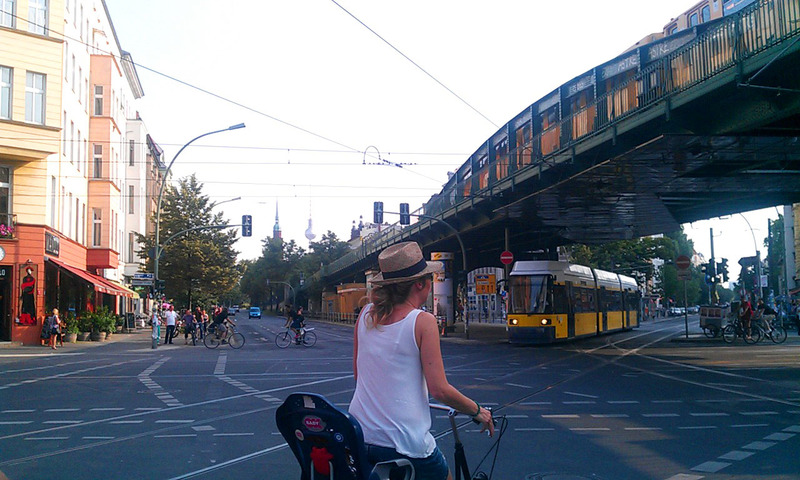 When you hit Schönhauser Allee again, you'll see an old factory across the street. This is the former Schultheiss brewery. It is now full of cultural enterprises, and is called the Kulturbrauerei. Cross Schönhauser Allee and continue running along the brewery on Sredzki Straße. At the big smoke stack where the cinema is located, turn left and run into the big courtyard within the brewery grounds. The courtyard is surrounded by a rambling collection of factory buildings, each now filled with clubs, studios and restaurants. Run straight north until you exit the grounds at the corner of Knaackstraße and Danziger Straße. Now you just have to turn left on Danziger Straße and run the one block back to the start at Eberswalder Straße U-Bahn station.